Selena was named as the top selling Latin artist of the 90s by the Billboard magazine and she was often called "Tejano Madonna" for her fashion choices. She also features among the most influential Latin artists of all-time. 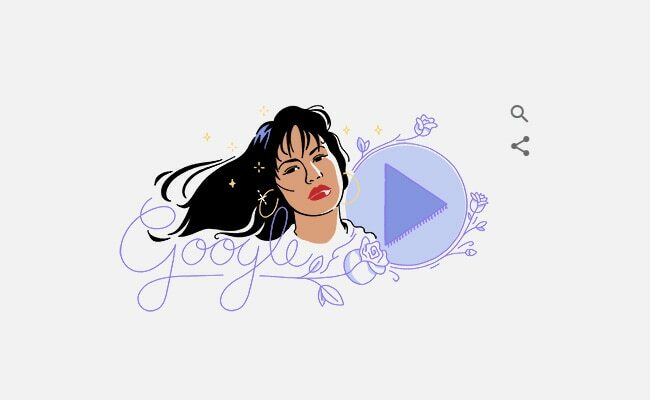 Google today celebrates American singer and song writer Selena Quintanilla, popularly known as Selena. Called the 'Queen of Tejano music', Selena became one of the most celebrated Mexian-american celebrities in the 80s and 90s for her contributions to music and fashion. Selena Quintanilla debuted in 1980 as a part of the Selena y Los Dinos band and began recording in 1982. Her popularity started to grow after she won the Tejano Music Award in 1987 as a teenager, which she won nine more times. She released her self titled album in 1989. Selena's album 'Entre a Mi Mundo', released in 1992, was at the top of the US Billboard chart for eight consecutive months. Her album 'Selena Live! ', which was released in 1993, won Best Mexican/ American Album at the Grammy Awards. Selena's 1994 album named 'Amor Prohibido' went on to become one of the best-selling Latin albums in the US. Selena also became an icon for young women but was often criticised for her outfits. She was also appointed the spokesperson of Coca-Cola in Texas. In 1992, Selena eloped with her guitarist Chris Perez after her father raised concerns over their relationship. Selena was killed by the former manager of her boutique and friend Yolanda Saldivar. "Selena was also much more than a talented musician. A fashionista and trendsetter, she often designed and created entire outfits for her performance wardrobe. In her free time, she was also active in community service, including being a strong advocate for education," said Perla Campos, Google Doodles Global Marketing Lead. She added, "It's incredible that Selena's legacy grows even larger with time. She continues to show Latinx, immigrants, and bicultural communities around the world to be proud of who they are and to embrace their differences. Also, to work hard for your dreams because doing so makes your achievements that much more meaningful." In 1997, Jennifer Lopez played Selena in a film about her life and career. Selena has so far sold over 60 million copies of her albums worldwide.